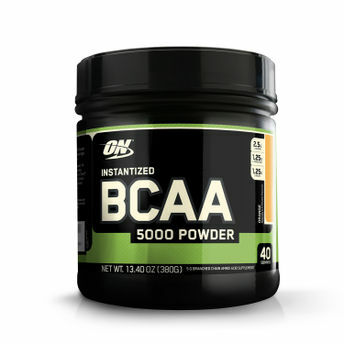 Optimum Nutrition's Instantized BCAA 5000 Powder provides a 5000 mg blend of the three Branched Chain Amino Acids (L-Valine, L-Leucine and L-Isoleucine) in every serving. The Branched Chain Amino Acids (BCAA's), so named because of their unique branched chemical structure, are essential in that the body cannot make them from other compounds. In recent times, these amino acids have been investigated for their potential anticatabolic which prevents muscle breakdown and anabolic for muscle building effects. Mixes Easily with a Spoon. Leucine, Isoleucine, & Valine in 2:1:1 Ratio. Supports Muscle Building & Recovery Efforts. Explore the entire range of Post Workout available on Nykaa. Shop more Optimum Nutrition products here.You can browse through the complete world of Optimum Nutrition Post Workout .